The jacket is arguably the hardest part of the dog to groom. The undercoat is raked out weekly (see this video), after which the coarse wire hair is groomed to sit tight around the body. I am still struggling with grooming the jacket myself. You can spend hours, even days on this, because it can always be improved by removing just one more hair… It’s hard to know when you’ve done enough! If you just want to do a pet-trim, you can trim the jacket a couple of times a year. But if you want to keep your dog in near-show-condition, you should work on the jacket at least bi-weekly. I’m trying to work on Jaz’s jacket each week, not only to get better at it by doing, but also because as soon as I lift her off the table, I seem to be finding at least 10 more things that could be improved… 😉 Despite the fact that the results may not be perfect, I hope the following tips, pictures and video are helpful to you! They are pictured below, along with a Chris Christensen buttercomb #002, which is what I use to brush through Jaz’s furnishings before I start grooming. I didn’t picture this comb in the last post, so I figured I’d include it now. The comb is nice and coarse, so it doesn’t pull any hairs out that aren’t ready to come out yet. 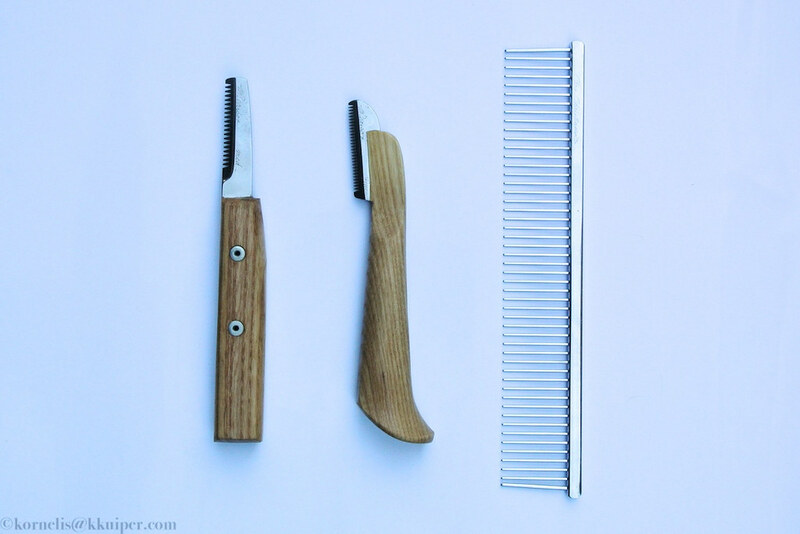 Tools: two different stripping knives and a coarse buttercomb. The hair on the jacket is kept longer than the hair on the flats. I use the fine stripper to strip the center of the jacket, where most of the hair will be trimmed down to roughly the same length. I use the medium stripper (which is a little more forgiving) along the edges, where the coat gradually needs to transition from longer to shorter (when blending jacket into flats) or shorter to longer (when blending jacket into furnishings). To figure out which hairs need to go, I pull/brush them up and see which ones are longest. Once you’ve done a rough all-over, you can start comparing sides making sure your dog isn’t furry on the left and bare on the right. The goal is to trim the jacket to sit tight around the body (anything that sticks up or out needs to go! ), with minimal waves or “creases,” as it’s called. The smoother the better. To prevent your terrier from looking like an armadillo (which is what creases will result in), you must be careful not to use the full length of your stripping knife’s blade, but just the tip. This guarantees that you pull out little locks of the hair at a time (whatever you can pinch between the tip of the blade and your thumb), not entire rows at a time. The latter will result in creasing, for rows of hair pulled out together will also grow back together in continuous, waving motion, resulting in creases in the coat. Just using the tip of the blade will make the grooming process more lengthy, but the results are well-worth the extra effort. When looking at your dog’s profile (when properly stacked on the table), the arch from the top of the head to the middle of the back needs to be smooth, and the back and bum need to be level. Make sure you step back a few times during the grooming process, to assure yourself you are achieving the desired outline. This entry was posted in Breed, Grooming, showing by rhonda. Bookmark the permalink. Weer een mooi hoofdstuk voor een boek dat nog lang niet af is ! Top, Jaz ziet er weer prachtig uit. Tja, heeft pa me het gras voor de voeten weggemaaid: knap stukje tekst en mooie foto’s, om nog maar te zwijgen over het filmpje! Goed hoor! Thanks! Ja, Kornelis helpt met de filmpjes… mooi niet!? 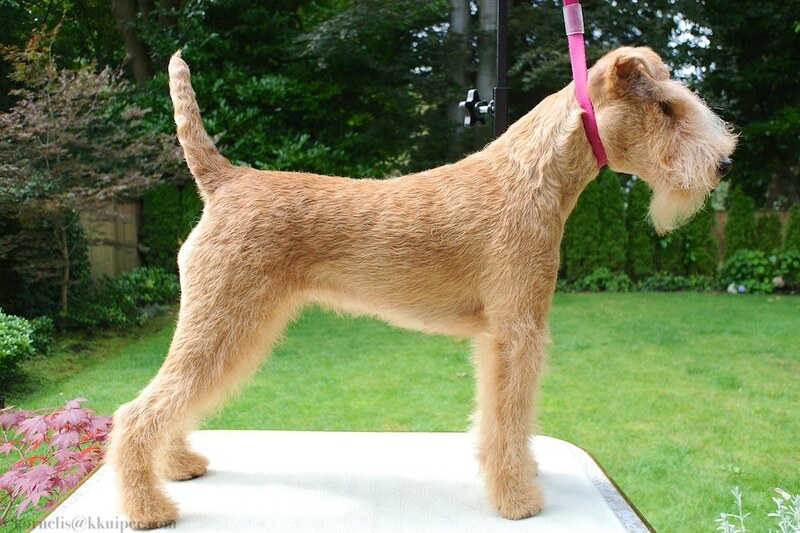 Hi, I just found your blog and I am really happy with the way you explain how to groom a lakeland. I bough a red Lakeland puppy and he turned 6 months old today :). I decided to start stripping him and this blog is being really helpful and provides detailed information I needed to know. but I got a question… I started stripping my puppy because he started looking like a teddy, when I strip him, his coat is really soft and his colour lighter than he was before… is that normal? I can send you a pic if you want to have a look at him. First of all, congratulations on taking the time and effort to hand-strip your Lakie! Doing your own grooming not only creates a special bond between owner and dog, but it also helps you detect sickness or injury much sooner, as you will be very familiar with your dog’s physique. Thank you for visiting my blog, I’m so happy that you are finding it helpful! As far as your question is concerned… Since your Lakie is still pretty young and probably hasn’t been stripped often, I wouldn’t worry about the colour and texture of the coat just yet. Most likely, the wire-hair hasn’t grown in yet. What you are seeing and feeling is the lighter, softer undercoat, which is completely normal on a young Lakie. If you continue to strip on a regular basis, you should quickly see the wire-hair come through – just keep at it! 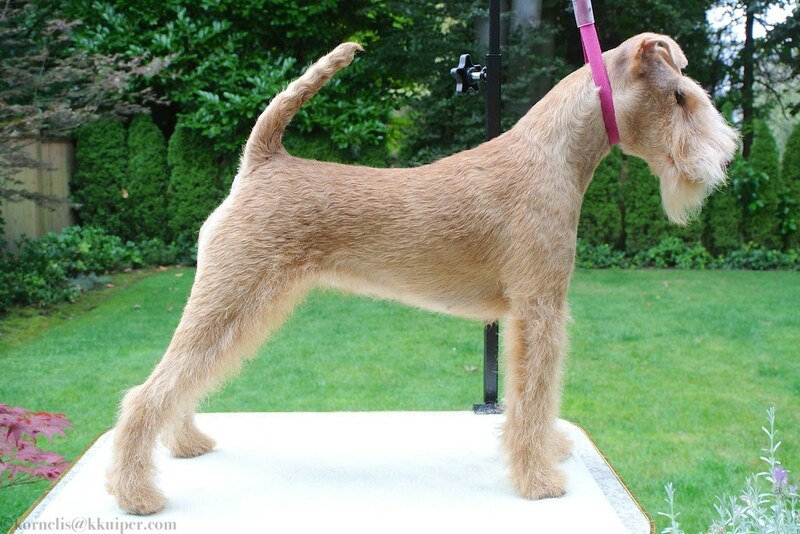 [If, after several more grooming sessions, you still don’t see/feel the coarser, darker, wire-coat come in, you may accidentally be cutting the coat instead of pulling it out at the root. If this is this case, make sure the tools you use for stripping are blunt. Long story short: strip on a regular basis, make sure your tools are blunt, and you will get the results you are after, I promise! Good luck & keep me updated!